2018 Will Be Loads of Fun! The 2018 Tahoe Donner 4 Wheel Drive Club, Trail Run and Event Calendar, is being developed over the next few weeks, and will include Bodie Ghost Town, The Easter Jeep Safari in Moab, Utah in addition to local Sierra and Nevada trips and trail/area maintenance events. We also are planning on having regular monthly socials the first Saturday of each month so members and those of you interested in joining, can come and learn more about the Club. See the CALENDAR TAB on our web site for dates and times. We’d love to have you join us! You can find our web site at www.td4wheelers.org . 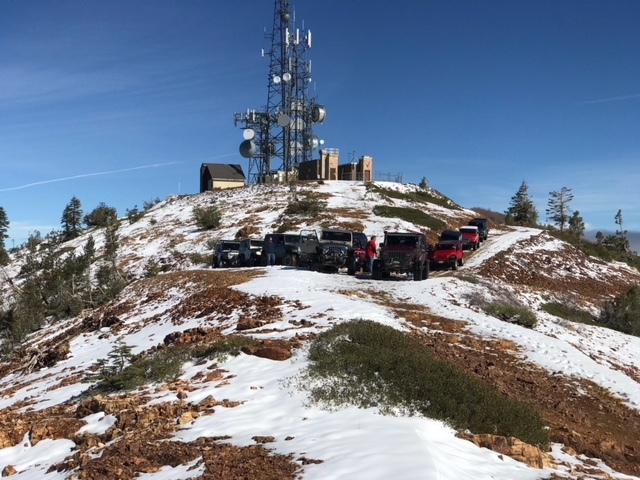 Eleven Jeeps made the trip up Signal Peak to see the beautiful views and the old Central Pacific Railroad (CPRR) Snow Shed Fire Lookout. Eight Jeeps took the OHV trail via Eagle Lake Road to the peak negotiating washouts, large rocks and wet/snowy slippery conditions. Three Jeeps took the Forest Service Road from Cisco Grove enjoying the ridge line views, meeting at the top. It was a sparkling blue day with spotty snow at the top. Wow, what an amazing place to have lunch and see the surrounding area! The CPRR Fire Lookout was built in 1909 and abandoned in 1934 – if you are a history buff, see www.cprr.org for more information. 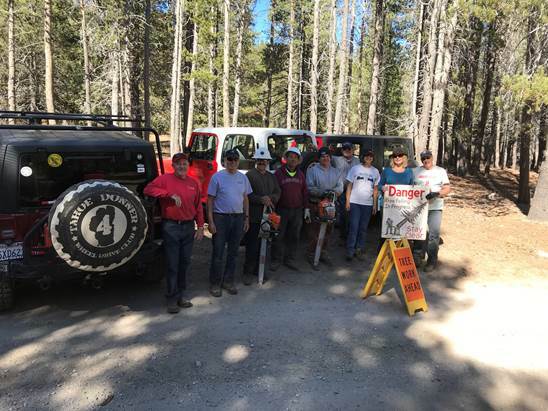 Euer Valley Annual Maintenance Day, October 14th: On a brisk 28 degree Saturday morning, five jeeps drove down into Euer Valley to undertake a day of cleanup and maintenance with members of the Tahoe Donner Forestry Crew. Sheila and Ron Raumer, Deborah and David Gray, John Scherer, Bill Ratcliff, Rich Jensen, and two TD Forestry Department members focused on an area heavy with downed trees and dead wood. Chainsaws, rakes, pruners and gloves emerged and the day got underway with the mighty roar of chainsaws. The team dragged the dead wood slash into open space piles for future removal by the TD Forestry Department. Large log rounds were stacked by the road and picked up by the Forestry Crew to be taken to the wood yard for sale. Small rounds, limbs and branches were added making 10 new burn piles. By day’s end, 14 standing dead or broken trees and 16 downed trees were addressed. In a normal year, TD Forestry burns approximately 500 burn piles. This past hard winter greatly added to the workload and they have toiled tirelessly to get the job done amassing 1000 burn piles. Thanks to Bill Houdyschell, the TD Forester, and his capable team for all their hard work keeping us fire safe! Also, a big thanks to Rich Jensen for making the arrangements and to all that contributed to a successful day keeping Euer Valley a magical destination! We’ll do it again next year!